We are disciples of the teachings of Jesus. We worship together through song, prayer, sermon and scripture. We learn together in weekly venues, monthly group sessions and seasonal studies. We work and play together. We strive to welcome those who enter our doors and reach out to those in our neighborhood who don’t. We care about God’s vision of peace and love, and try to live our lives in the way of compassion and justice. We do our best to care for God’s creation in our use and reuse of our resources. 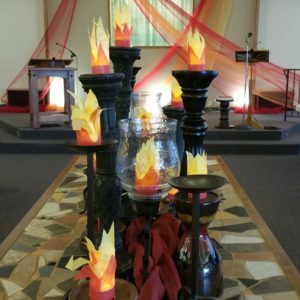 We trust that God’s Holy Spirit works through each of us and we support the passions and ministries of our congregation both financially and by nurturing each person’s use of their Spirit-gifts. We respect each others’ stories and accept each person’s place and progress in their own spiritual journey, while supporting their efforts and providing avenues for them to move forward in faith. We work hard at listening, learning and understanding those with opinions different from our own. Read more about First Christian Church’s long and rich history here.